Unique, technologically advanced DVR (Digital Variable Reluctance) motor produces 1-3/4 hp at 120 volts or 2 hp at 240 volts - more than enough power for shaping the edges of even the hardest woods with ease and no bogging. ...lets you select any speed up to 10,000 rpm for super-smooth shaping. ...includes a 17" x 22" main worktable plus fixed & floating extension tables that let you build support configurations that measure up to 40" deep by 22" wide for handling small or large components with precision & safety. 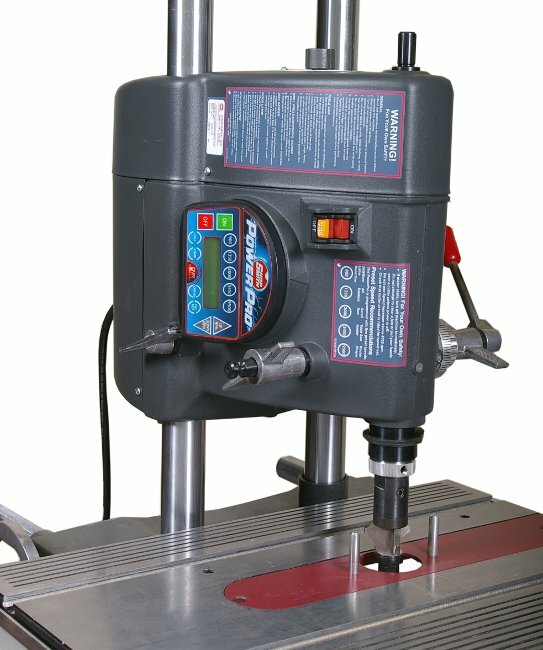 ...from the drill press function lets you raise or lower your shaper cutters up to 4-1/4" for achieving the exact profile you want - where you want it. 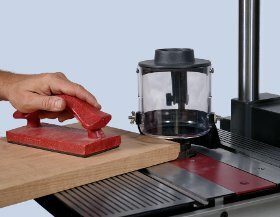 ...lets you achieve unique decorative edging cuts with your existing cutters that would not be achievable with conventional, non-tilting shapers. Where the molder is used primarily to create decorative accents on the surfaces of boards, the shaper is used to decorate board edges and create specialized joinery such as tongues-&-grooves, drop leafs, glue joints and more. Now offering your choice of under or over-table shaping... The Shopsmith has always offered over-table shaping capabilities. However, the new Mark 7 will now also function with the cutter below the worktable...a method preferred by many woodworkers. For example, if you're making an internal cut (as with a picture frame opening) you can simply drop the workpiece opening over the cutter, turn on the machine and go to work. Whereas with over-table shaping, this procedure would require you to raise and lower the cutter position each time you change workpieces. However, if you prefer to work with the cutter above the table, on the top surface of the workpiece, The Mark 7 will allow you to do this as well. Super-smooth, high-speed shaping at speeds up to 10,000 rpm... Most commercial shapers operate at high speeds, allowing their operators to create a wide variety of edging cuts for joinery or decorative accent quickly and smoothly. And although some commercial shapers offer two or three speeds... the ability to select an infinite range of speeds in 1 rpm increments (such as with the Mark 7) is virtually unheard-of ! 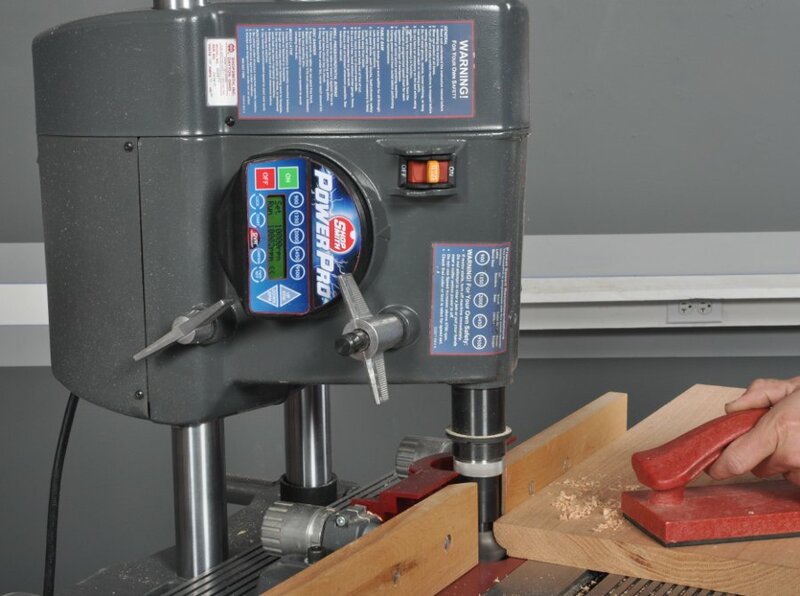 This broad range of speeds also allows you to avoid workpiece burning by slowing your cutter down to the ideal speed for working with hard or highly figured woods. Reverse operation... With the Mark 7 (as with costly commercial shapers), you can change the direction of the motor to cut in either forward or reverse direction. As a result, if you prefer, you can invert the cutter on its arbor and reverse the feed direction of your stock from one side of the worktable to the other. 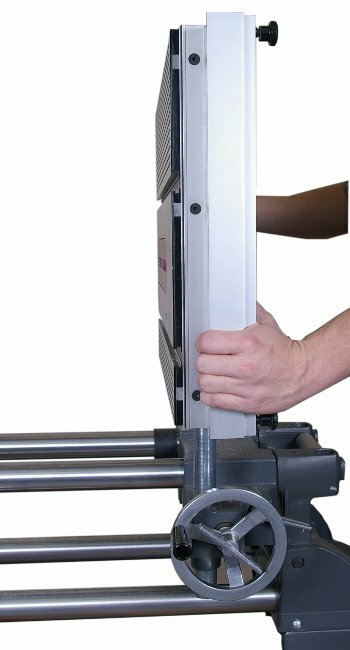 This reversing ability also allows you to access all profiles on a multi-profile cutter from the OUTside side of the machine (with no throat restrictions). A generous sized worktable... that allows you to create huge, supportive surfaces for handling super-long and / or wide workpieces by adding your included extension tables. The dual T-shaped slots in the worktable surface let you use your Shopsmith miter gauge to create fixtures or stops for controlling your stock... or hold those workpieces firmly while you shape straight or angled edge or end grains. You can even attach the Shopsmith rip fence to the surfaces of the main table or extension tables and use it as a guide or stop for improved workpiece control. Tilt your worktable and make unique, specialized cuts... Here's a unique capability that even commercial shapers costing up to $5000 don't offer ! Thanks to the Mark 7's full tilting worktable, you can make an infinite range of unique, angled decorative edging cut combinations that are impossible with fixed table commercial shapers. Just one more example of the Shopsmith's unique Shared Features concept.